11 Gloucester is located on the east side of Gloucester, between Marlborough and Commonwealth, with 9 Gloucester to the north and 13 Gloucester to the south. 11 Gloucester was designed by architect Willard Thomas Sears (of the firm of Cummings and Sears) and built for him ca. 1872, one of four contiguous houses (9-11-13-15 Gloucester) designed as two symmetrical pairs united by an uninterrupted mansard roof. At about the same time, he also designed 322 Marlborough on the adjoining lot to the east. Click here for an index to the deeds for 11 Gloucester. By 1875, 11 Gloucester was the home of dry goods merchant and textile mill agent Francis Milton Sawyer and his wife, Etha (Smith) Sawyer. They previously had lived at the Creighton House hotel at 245-247 Tremont. The Sawyers continued to live at 11 Gloucester during the 1879-1880 winter season, but moved thereafter. By the 1880-1881 winter season, 11 Gloucester was the home of William Gray Brooks, Jr., and his wife, Mary (Franks) Brooks. They previously had lived at 52 West Cedar. He was cashier of the National Eagle Bank; his brother was Phillips Brooks, Rector of Trinity Church and later Episcopal Bishop of Massachusetts. William and Mary Brooks continued to live at 11 Gloucester during the 1882-1883 winter season, but moved thereafter to 336 Marlborough. 11 Gloucester was not listed in the 1884 Blue Book. By the 1884-1885 winter season, it was the home of Dr. John Baker Swift, a physician, and his wife Hettie (Potter) Swift. They previously had lived at 78 Charles. 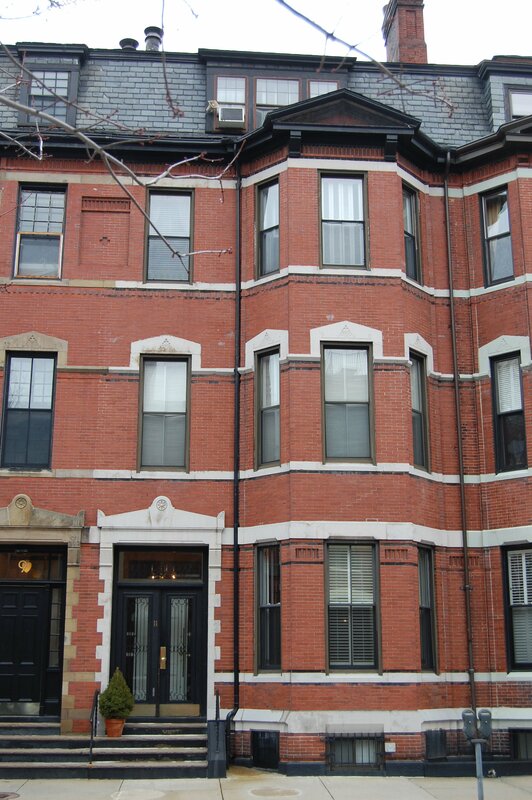 They continued to live at 11 Gloucester during the 1901-1902 winter season, but moved thereafter to 465 Beacon. 11 Gloucester was not listed in the 1903 Blue Book. By the 1903-1904 winter season, it was the home of Donald Gordon, an attorney, and his wife, Louisa Raynor (Ayer) Gordon. They continued to live there until August of 1907, when they purchased and moved to 9 Gloucester. On September 9, 1907, 11 Gloucester was purchased from the estate of Joshua Montgomery Sears (who had died in June of 1905) by Anna (Mitchell) Richards, the wife of Dr. George Edward Richards, a physician. 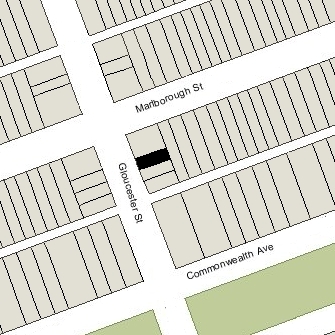 They previously had lived at The Marlborough at 416 Marlborough. They continued to live at 11 Gloucester during the 1915-1916 winter season, but moved thereafter to 334 Marlborough. On August 22, 1916, 11 Gloucester was purchased from Anna Richards by Harriet Amory (Anderson) Parker, the widow of Francis Stanley Parker (who had died in January of 1916). She lived at 391 Commonwealth. 11 Gloucester became the home of her son and daughter-in-law, John Stanley Parker and Violet Otis (Thayer) Parker. They previously had lived in an apartment at 52 Hereford. They also maintained a home in Bedford. John Parker was a salesman and, in 1920, was president of the Trico Carbonated Beverage Company. 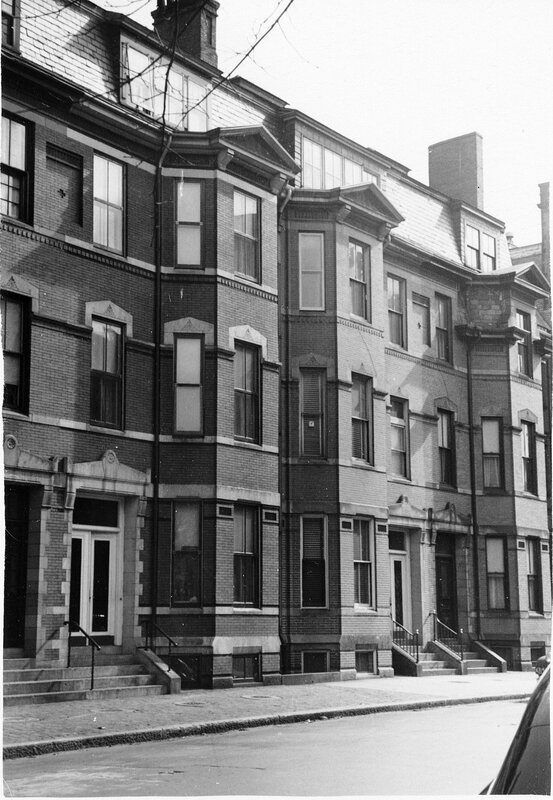 The Parkers continued to live at 11 Gloucester during the 1920-1921 winter season, after which they made their home in Bedford. During the 1921-1922 winter season, 11 Gloucester was the home of Col. James Dean Tilford and his wife, Helen Morewood (Ferguson) Tilford. A US Army Colonel, he was a federal aviation instructor assigned to the Massachusetts National Guard. By the 1922-1923 winter season, 11 Gloucester was the home of banker Robert Sturgis Potter and his wife, Dorothy (Tweedy) Potter. They had lived at 107 Beacon in 1921. On July 21, 1923, 9 Gloucester was purchased from Harriet Parker by Sibyl T. (Gilman) Blume Potter, the former wife of attorney Andreas Blume and the widow of canned food and cereal manufacturer Henry (Harry) Staples Potter. She had lived at 82 Commonwealth during the 1921-1922 season, and then traveled abroad. Upon her return, she lived temporarily at the Hotel Victoria at 273 Dartmouth. Robert and Dorothy Potter continued to live at 11 Gloucester during the 1923-1924 winter season, but moved thereafter to Manchester. Robert Potter was not closely related to Sibyl Potter’s deceased husband, Henry Staples Potter. By the 1924-1925 winter season, Sibyl Potter had made 11 Gloucester her home. She continued to live there until her death in August of 1933. The house was not listed in the 1934-1937 Blue Books, and was shown as vacant in the 1934-1939 City Directories. On January 7, 1937, 11 Gloucester was acquired from Sibyl Potter’s estate by real estate dealer Ray C. Johnson. On September 21, 1938, the Suffolk Savings Bank for Seamen and Others foreclosed on the mortgage it held on 11 Gloucester and took possession of the property. That same month, the Bank applied for (and subsequently received) permission to convert the house from a single-family dwelling into a lodging house. On October 24, 1939, 11 Gloucester was acquired from the Suffolk Savings Bank by Miss Marguerite G. Gage, who operated it as a lodging house. She previously had lived at 85 Appleton. She continued to live at 11 Gloucester and operate it as a lodging house until her death in 1963. On November 15, 1963, 11 Gloucester was purchased from Marguerite Gage’s estate by Charles A. Deluty, trustee for the benefit of Ruth F. Eaton. The house was shown as vacant in the 1965 City Directory. From about 1966, it was a dormitory for the Saint Philip Neri School. The dormitory previously had been located at 34 Gloucester. On September 12, 1968, 11 Gloucester was purchased from Charles Deluty by Gibson Dorms, Inc. From about 1969 to the mid-1970s, it was a dormitory for the Juliet Gibson Career and Finishing School, located at 285 Huntington. On June 25, 1979, 11 Gloucester was purchased from Gibson Dorms, Inc., by George D. Brown and his wife, Sharon Hornberger-Brown. In August of 1982, they applied for (and subsequently received) permission to convert the property into four apartments. On November 2, 1982, 11 Gloucester was purchased from the Browns by Kevin J. Ahearn and Charles F. Norton, Jr., trustees of the 11 Gloucester Street Realty Trust. 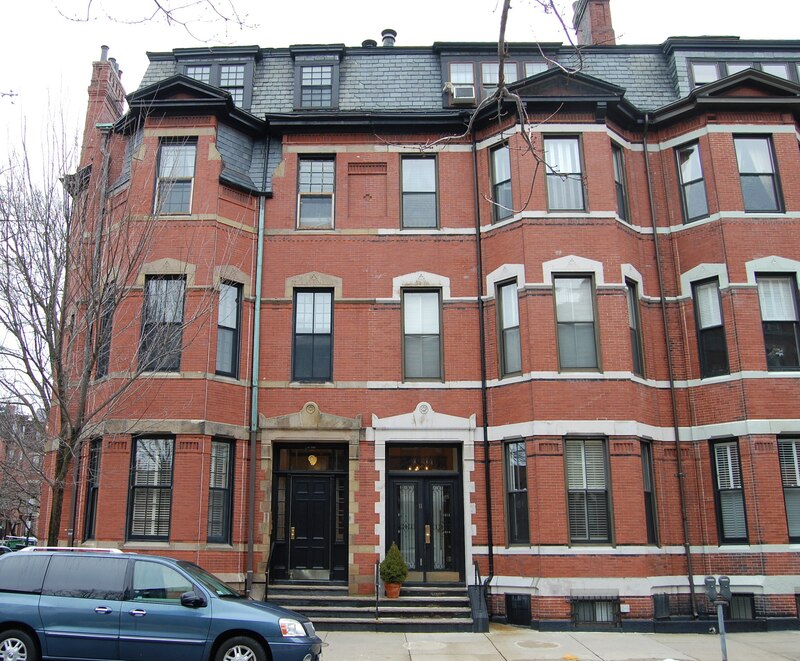 On May 23, 1983, they converted the property into four condominium units, the 11 Gloucester Street Condominium.